Are you ready to hit the road with the Red Sox? Red Sox DestiNATIONs is hoping fans will respond to five trips offered this summer. Check out some scenes from three previous trips and let us know if this appeals to your inner baseball fan. 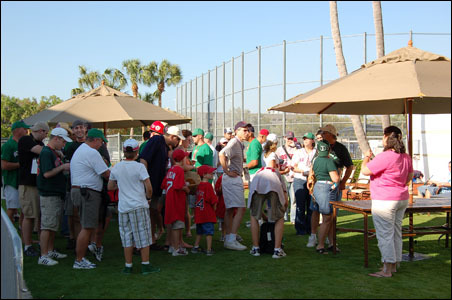 At left, participants gather at the City of Palms Park in Fort Myers. Red Sox road trippers take batting practice in the field, get a tour of the ballpark, attend games and have a barbecue with Red Sox players.